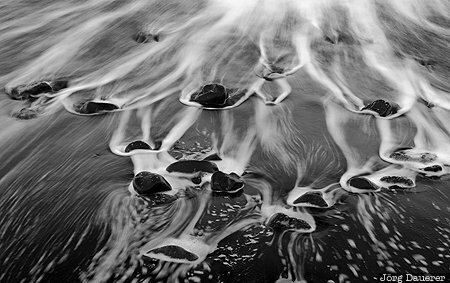 The surf of the outgoing tide is leaving white traces on the pebbles and the black lava beach near Vík. Vík is in Suðurland in the south of Iceland. This photo was taken in the evening of a cloudy day in August of 2013. This photo is part of the exhibition The Beach (June 2015). This photo was taken with a digital camera.